The powerful antioxidant formula in each HelioCare™ capsule is naturally derived from the extract of a fern native to Central and South America. This fern, Polypodium leucotomos (PLE) has been used for centuries as a remedy for skin related conditions. Once an aquatic plant PLE fern has adapted to life on land and created its own protection from exposure to harsh UV rays. By using this organically grown extract, HelioCare™ delivers antioxidants that protect the skin from the first day you use it. HelioCare™ active extract contains antioxidants which aid in eliminating free radicals produced by sun exposure. A reduction in these potentially dangerous radicals help maintain younger-looking and more resilient skin. Sunscreens play an important role in protecting your skin from the sun. However, many environmental factors can reduce the effectiveness of your topical sunscreen including weather, location, and what you are doing in the sun. For example sweating and swimming will compromise your sunscreen effectiveness. How do I take HelioCare? Take one capsule daily in the morning. If prolonged sun exposure is expected, take one capsule one half hour before exposure and a 2nd, 2-3 hours later. Who benefits from taking HelioCare? All skin types can benefit from HelioCare™ Damage from the sun can happen all year long, on a cloudy or sunny days. Even in cold climates people are still exposed to the dangers of the sun on a daily basis. Because this is an oral supplement speak with your pediatrician about any vitamins or supplements for your child. 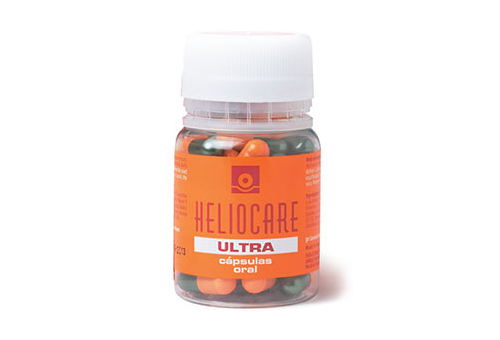 *HelioCare™ capsules are not a sunscreen and should be used in addition to sun protection.